Crossing new borders is exactly what we did. We had rested in Mae Sot where we enjoyed social times with other cyclists and especially Mo and Marie which was really nice. Time had come and new adventures waited for us in Myanmar, a country that has been fairly closed for the last 30 years due to the political situation. Cycling from Mae Sot to the border is a mere 6 km ride through lines of trucks waiting to cross the border. The street is filled as always in main border areas with buildings housing import and export companies. We passed the Thai immigration in less than 10 minutes and in front of us were nothing less than 6 other cyclists, which we had not imagined before. At the Myanmar border control a form was filled in and a photo taken. That was all, welcome to Myanmar! Only a few years ago tourists could not go overland from Myawaddy to Yangon and if you wanted to travel in the country a detailed travel plan had to be approved and you would have to check in with the police. Now we were welcomed and free to be on our way! Myanmar is a mysterious place and has a great force to attract travellers. 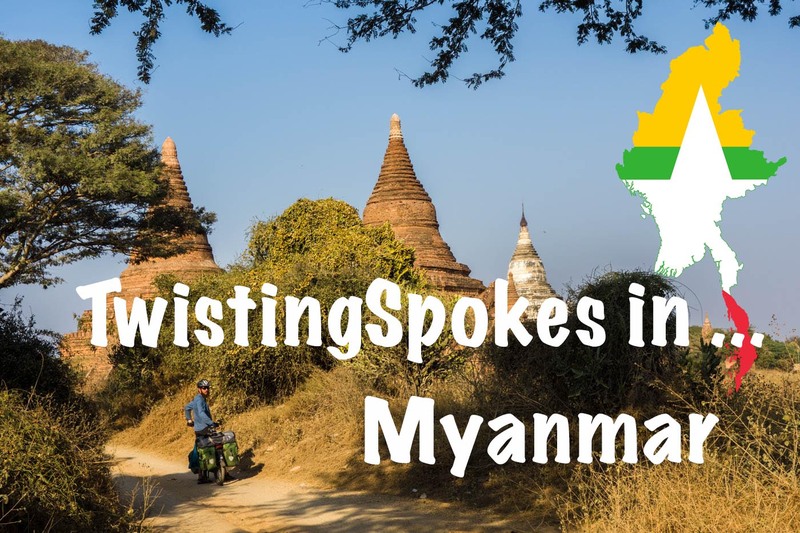 This has also attracted us and even when we decided on our route choice it was not yet possible to cross Myanmar overland and exit at the Indian border of Tamu to Moreh. Now it has been possible for more than a year and the word is spreading. After entering Myanmar we exchanged our Thai Baht to Kyat where 1$ is around 1300Kyat. A new currency, language, this is always quite wonderful how changes of countries can influence us. We cycled out of Myawaddy trying to understand as much as we could as we cycled past people and shops. Out of Myawaddy there is a notorious road going over a pass of 800m, we had heard rumours of a new road but no real details. So we did not know what to expect. We got to the cross road and looked at the map and the road. We decided on the new road. A few hills medium steep and we were at 480m, this was the top! On the top an army post were overlooking the traffic and as we got there they went on patrolling in full combat gear, rocket launchers and grenades, all geared up. Looked as this region might still see internal battles. We zoomed down the road, a perfectly new built road with help from the Thai government. As we were talking about lunch we saw Mo and Marie sitting in a hut off the road so we all had lunch together. We have been in contact with Mo since we met him in Turkey crossing from China to Germany by bicycle. 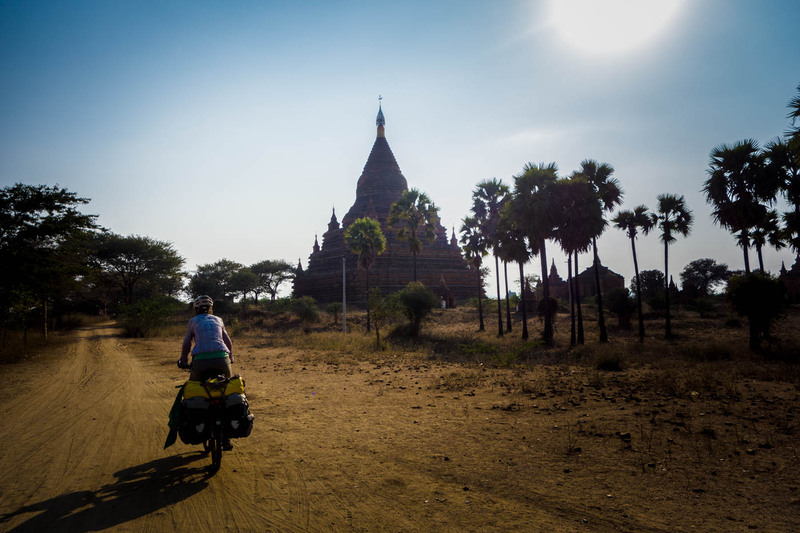 We decided to cycle on and not stay in Kawkreik because it was only midday and we wanted to see more of Myanmar. Camping in Myanmar is not allowed and people might turn you in to the police if they find you. This were the thoughts going through our minds as we searched for a place to pitch our tent. We were with four of us so we needed a bit more space for the tents. Marie said: “hey it’s time and I am tired so let’s turn off on this small road”. That we did and a few people saw us ridding down this small dirt road into the fields of Myanmar. After searching for a bit we found a good spot out of sight and flat for the tents. Getting found is not a big issue and police will just tell you to pack up and go to the next hotel. Only hotels where foreigners can stay are scarce, expensive and far in between. We slept well and were not spotted so no issue at all. 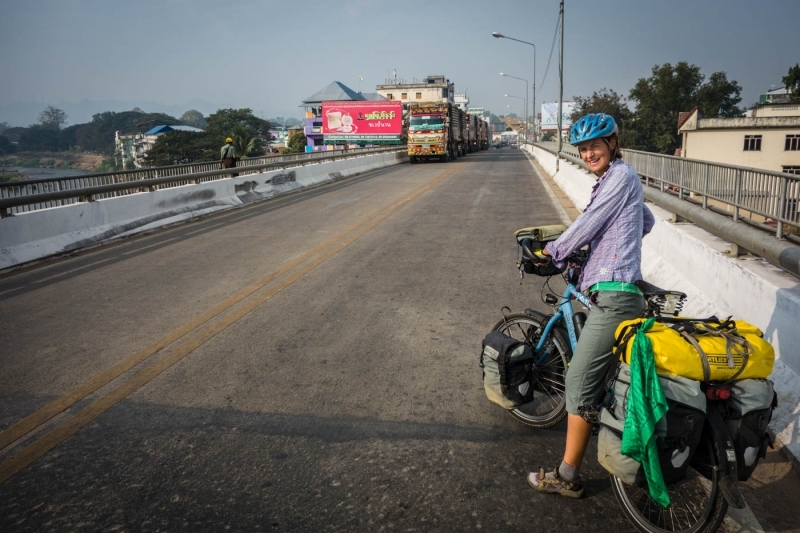 We packed up and cycled in the direction of Hpa-an another 70km from our camp spot. The South East of Myanmar seems to have a great deal of caves and we went to see one on the way. It is common to find several Buddha statues inside the caves and this one was no exception. We had a small walk around and enjoyed a break from the road and from here just 10km to Hpa-an. Hpa-an, described as a scruffy looking city with little to offer, was our first city in Myanmar and we had no expectations. We found a guest house recommended by a couple we met in Mae Sot and got a simple room for the night. Walked the streets of Hpa-an which is located on the banks of the Salween river, another major river coming from Tibet in China. On the river we saw quite some big ships apparently coming or going to China. Rain for the first time in a while and it was coming down hard so we decided to see how it would progress and hit the road if it cleared up. By noon we were lucky so packed the bikes and then first headed for a lunch stop at a Burmese restaurant. It was recommend by another cyclist couple we met in the guesthouse Anna and Claudia from Germany on a tour through different parts of the world and heading to India as ourselves. The lunch was so so great and we were stuffed when we got back on the bicycles. The rain was back for a while but we decided to cycle on. The weather was nice and cool and we enjoyed the cycling crossing the Salween river and cycling past nice rocky karst mountains. We saw a road to another cave and decided to have a look this time combined with a hot spring and crazy monkeys and chickens jumping around. We walked around and into the cave. A nice little experience. The funny thing is that in Myanmar you are expected to enter the area without shoes and socks. We have seen this in many places before but here in Myanmar the area is usually not kept very clean so we leave the place with muddy feet from leaves, monkey and chicken poo. We saw two bicycles standing at the next military check point. To our surprise it were Claudia and Anna! As we had said our goodbyes in Hpa-an they had decided to cycle out also despite of the weather. We cycled together and reached the small town of Thaton and a massive pagoda stands in the town. We searched for a guesthouse that would fit our needs and a nice local couple showed us the way after having asked around even at the pagoda itself, some locals had told us to ask there but they kindly refused. The little place we found had a room that would fit 4 so we agreed, we all like to have our bicycles close by so we filled the room up with 4 bicycles and had fun with this. Had a great dinner and slept well. Thaton is a nice little town and the atmosphere and vibe really suited us, maybe because we had no expectations and were happily surprised by the feeling. Cycling together can be nice and we enjoyed the cycling with Claudia and Anna, they really like to push a good speed and were good company. So we hung on with an average of 20km/h which is a bit more than our normal speed but we made some great distance. Teahouses of Myanmar are a new favourite, we had heard about the tea/coffee culture of Myanmar but never really thought more of it. Anyway we stopped at a small market and found a nice teahouse. Here they served us with all these great snacks: samosas, pancakes and a kind of falafel. We had a feast with the four of us and enjoyed the mingling with people at the tea shop. After a great morning snack we pushed on and reached Kyaikto by lunch, this was where Claudia and Anna would turn off and stay for a few days near the Golden Rock, we decided to push on. Around sunset we were in the river delta closer to Yangon and no easy spot to camp and no real villages. After a bit of cycling (a 115km day!) we reached a small villages where we could stay at a temple and a local man helped us with arranging with the monks. We were shown a separate building where we could sleep. The man helping us explained that we had to sleep separate, so girl here and man there ok! Yes Yes 🙂 We slept separate (in the same room) and had to wake up at 5am, we woke up and nobody was around so we left in the dark. Up the road there was a shelter where we could cook breakfast and relax a bit. As the sun rose people started their daily life. 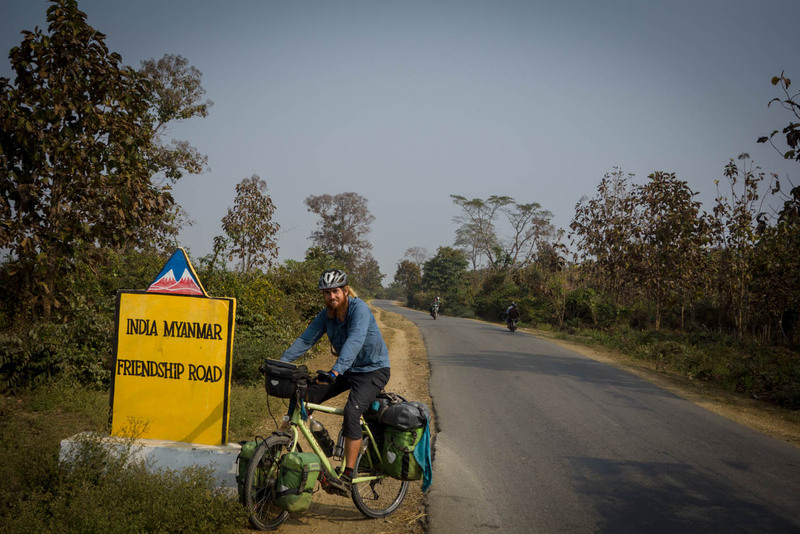 Yangon was now just 130km away so we decided to kick the pedals and reach Yangon in a day. The road was quite good, a bit busy but no problems. We reached the ancient city of Bago for a morning stop at a teahouse. At the teahouse we got some nice Chinese steamed buns and a sweet tea. The last 90km were not so inspiring and we just pushed the km’s and reached the hectic streets of Yangon in the afternoon. It is always hard to have correct expectations about a city or country. Until now Myanmar has surprised us with being good preparation for what we expect to find in India. At the same time the people, colonial legacy and current interesting politic situation are charming us more day by day, not to forget beautiful sunrises and sunsets in combinations with golden pagoda’s. Yesterday we enjoyed the streets of Yangon and the great treats of the different kitchens and teahouses. As you might know Myanmar was a former English colony, this really shows here in Yangon with great old style buildings some in better shape than others. It isn’t hard to imagine how interesting history has been and it makes for some interesting stories in mind. Next stop should be Bagan and the more than 3000 pagodas! Thanks folks! Just about to head into Myanmar by bicycle in a couple of days. Good to see camping and temples are viable options, and that you’re enjoying the whole experience! I’m Looking forward to it too!